The Knight, together with his Squire and Yeoman, were the first three characters to join the original figure in our Canterbury Tales range – The Wife of Bath. Designed for Rye by Tony Bennett, the three new additions were enthusiastically received by our customers and it quickly became apparent that our Canterbury Tales range had a band of loyal collectors. 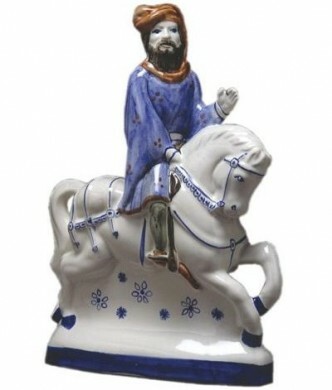 The noble character of the ‘parfit gentil Knight’ is well displayed both in his powerful horse and his ornately decorated cobalt tunic with rather splendid turban-style head gear.